How small a signal can you detect? 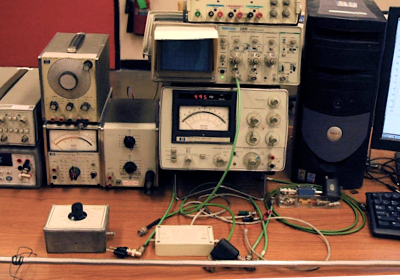 In electronic measurements, we observe "signals," which must be distinctly above the "noise." Noise induced from outside sources may be reduced by shielding, filtering, and proper "grounding." Less noise means greater sensitivity to the desired signal, with signal to noise ratio as the figure of merit. However, there exist fundamental sources of noise which no clever circuit can avoid. This intrinsic noise is a result of the thermal jitter of the charge carriers and the quantization of charge. You will measure one of these two limiting electrical noises: the Johnson noise in a resistor as a function of temperature above absolute zero. From your measurements you will derive the value of the Boltzmann constant, k. Johnson Noise and Brownian Motion are examples of the fundamental relation between fluctuation (equilibrium) and dissipation (out of equilibrium).